For every era of war, peace, and progress in this country and around the world, there are women who have been and will be working tirelessly to make their voices heard, and affect change. These women march, write, and speak to ensure a more open, just, and peaceful world. For children who are growing up and learning what the women before them have accomplished, these true stories are sure to inspire. 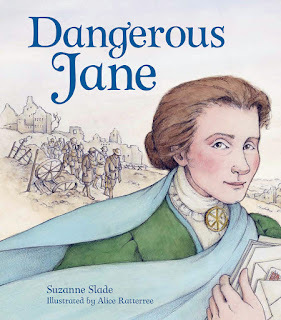 This energetic and inspiring picture book biography of activist Jane Addams focuses on her efforts toward peace during WWI that eventually won her the Nobel Peace Prize. From the time she was a child, Jane’s heart ached for others. At first the focus of her efforts was on poverty, and led to the creation of Hull House, the settlement house she built in Chicago. For twenty-five years, she’d helped people from different countries live in peace at Hull House. But when war broke out, Jane decided to take on the world and become a dangerous woman for the sake of peace. Read an excerpt. Check out the Teacher's Guide. All Bessie wants is to go hiking with her father and brothers. But it’s 1896, and girls don’t get to hike. They can’t vote either, which Bessie discovers when Susan B. Anthony comes to town to lead the campaign for women’s suffrage. Stirred to action, Bessie joins the movement and discovers that small efforts can result in small changes—and maybe even big ones. 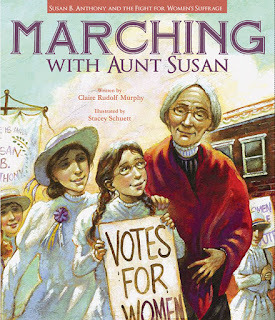 Inspired by the diary of the real Bessie Keith Pond, a ten-year-old girl who lived in California during the suffrage campaign, author Claire Rudolf Murphy and illustrator Stacey Schuett offer a thought-provoking introduction to the fight for women’s rights. Check out the Teacher's Guide. In 1863, when Ida B. Wells was not yet two years old, the Emancipation Proclamation freed her from the bond of slavery. 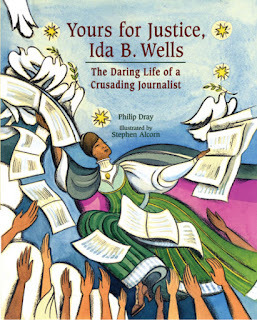 Blessed with a strong will, an eager mind, and a deep belief in America’s promise of “freedom and justice for all,” young Ida held her family together, defied society’s conventions, and used her position as a journalist to speak against injustice. But Ida’s greatest challenge arose after one of her friends was lynched. How could one headstrong young woman help free America from the looming “shadow of lawlessness”? For more books featuring self-empowered females, check out our Books to Celebrate Women in History, Books with Character, and Books with Strong Heroines round-ups.